This Sunday, instead of going out for a romantic Valentine’s Day dinner, you can treat your sweet babboo to something a little different: an intimate breakfast in bed, complete with fresh squeezed juice and coffee. And, if you take the time to source your ingredients from local farms and producers you’ll get points for the added love on your plate. At Estero Cafe in Valley Ford, husband-and-wife co-owners Samantha and Ryan Ramey draw upon the west county’s free-range egg farmers and artisan producers to elevate their hearty all-day, every-day breakfast dishes. On many mornings, the cafe is filled with the same farmers they source from, who stop by to fuel up for the day. 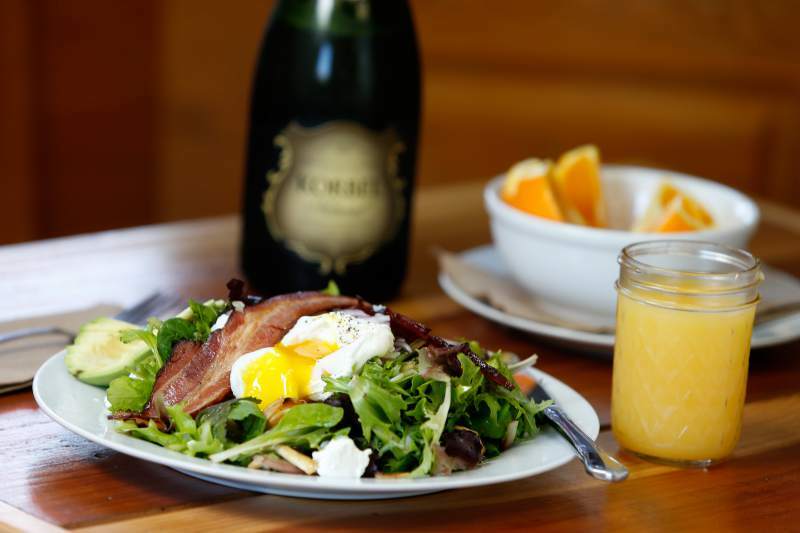 At Estero Cafe, one of the most popular dishes is the Breakfast Salad, featuring warm slices of bacon and sauteed mushrooms plus a poached, pastured egg from Hands Full Farm in Valley Ford, served on top of fresh spring mix dotted with avocado and Pug’s Leap Chevre from Petaluma. Another heart-warming egg dish from the homey cafe is the Sonoma Omelet, filled with local spinach, onions, Mycopia mushrooms and the nutty, sweet Estero Gold cheese from the Valley Ford Cheese Co. The spinach, onion and mushroom filling is cooked in one pan, and the eggs are cooked in another. If you want really dress up the plate, you could also fry up some crispy hash browns that you’ve prepped the night before. “We start with Yukon Golds and parboil them until they are three-quarters of the way cooked,” Samantha said. After the potatoes cool, they are thrown into the refrigerator until morning, when they are grated and tossed with salt, pepper, cilantro and green onions. 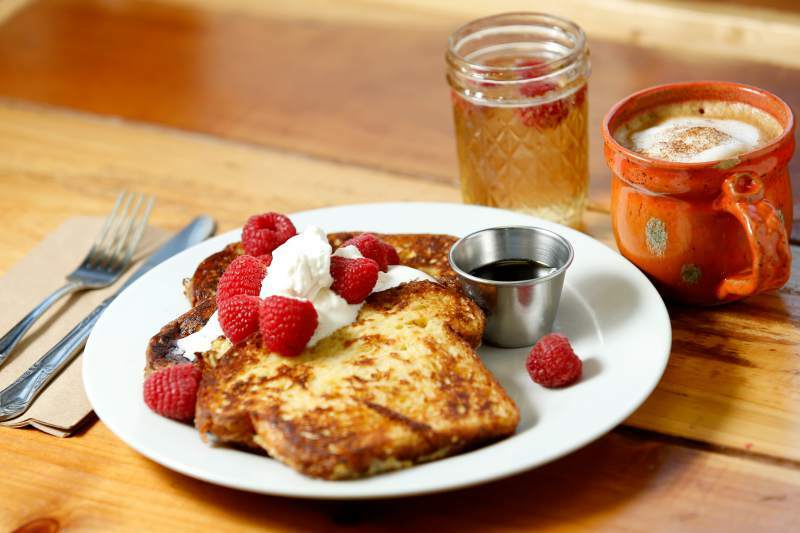 If your sweetie likes a bite of something sweet in the morning, the Estero Cafe has just the thing: a French Toast that’s so easy, even a child could make it. The secret is the eggy brioche bread from Village Bakery of Sebastopol. Although everything is made from scratch, there is rarely a long wait to get into the cafe, which seats seven at the counter and about 25 at tables. The couple purchased the Estero Cafe a little over a year ago. Samantha, who also manages the Bodega Bay Farmers Market, grew up on Long Island in a confirmed food family. Her grandfather and father were in the wholesale meat and provisions business, delivering high quality meats all over New York City. She met her husband, Sonoma County native Ryan Ramey, while working in a restaurant in San Diego. The couple moved to Bodega Bay five years ago and started cooking at the local farmers market while Ryan cooked at Tolay Restaurant & Lounge at the Sheraton in Petaluma. Then they decided to start their own business, Northwest Catering. One of Samantha’s favorite Valentine’s Day memories is when Ryan woke up early to toast bagels he had made from scratch. The following recipes are from Samantha and Ryan Ramey of Estero Cafe in Valley Ford. They source their brioche bread from Village Bakery in Sebastopol and use organic Driscoll raspberries from Watsonville. Whisk eggs in a large bowl and mix in milk, a quarter of the vanilla bean (or extract) and cinnamon. Dredge slices of brioche in the egg mixture (2 – 3 slices per person). While you let them soak: With an electric mixer, or by hand, whip cream with a quarter vanilla bean (or 1/4 teaspoon extract) and a tablespoon of maple syrup till peaks stand on their own — transfer to container and refrigerate. Serve hot, topped with a teaspoon of fresh room temperature butter, the whipped cream, berries and maple syrup. For the following dish, Estero Cafe sources the baby mixed greens from Laguna Farms in Sebastopol, the mushrooms from Mycopia Gourmet Mushroom Company in Sebastopol, and the bacon from the Sonoma County Meat Company in Santa Rosa and the Pug’s Leap Chevre from Petaluma. Most of these can be found at Oliver’s Markets. Make salad dressing in food processor or in bowl with a whisk. Finely chop shallot, garlic and thyme. Mix in mustard and honey and add the vinegar. While mixing slowly pour in the olive oil. Put in a dispenser and set aside. Makes 8 ounces but salad only requires 4 tablespoons. Chop potato and fry in hot oil or saute in a pan. Slice mushrooms and onions. Crisp sliced bacon (in a pan or on a bake sheet in the oven) and saute onions and mushrooms with a drop of oil. Simmer a small pot of water with a splash of apple cider vinegar in it for poaching eggs. Carefully slice avocado and scoop out and serve each salad with a quarter of an avocado. Scoop and serve 3 quarter-size balls of chevre on each salad. Put sliced onions on top of your salad. With a spoon, transfer hot mushrooms and crispy potatoes to salad and sprinkle all around. Place two strips of bacon on the top of each salad. Using a slotted spoon, carefully remove poached egg and carefully place in between bacon strips on the top of the salads. Garnish egg with cracked pepper. Slice mushrooms and onions and grate cheese. Set aside for cooking. Chop cilantro and slice green onions . Shred cooled potatoes into a large bowl with a cheese grater and mix in green onions and cilantro. Mix well. Whisk eggs, Heat three skillets with the clarified butter. Drop hash brown mixture down and spread evenly in the pan and then leave to get crispy. Season with salt and pepper. Drop sliced bread in toaster and pop open jam for service. In second skillet, cook onion and mushrooms for 2 minutes until browned and then add spinach. Next, cook half your scrambled eggs in third skillet on medium heat, spread the egg out evenly to cook using a rubber spatula and once there is only a little liquid on top, flip the egg. (If you are unsure about this step, finish omelet in oven using a cast-iron skillet. Fill one side of omelet with mushroom, onion and spinach mixture and sprinkle shredded cheese inside, then fold and sprinkle more cheese on top. Repeat this process for the second omelet. Once the bottom of the hash browns is browned and crispy and has lifted a little off the skillet, flip them over with a metal spatula. 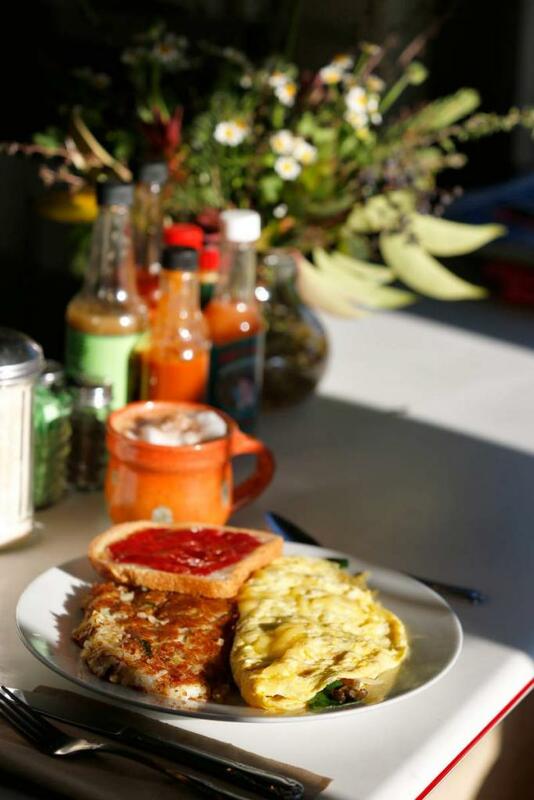 Serve half the hash browns and a omelet on each plate and serve with buttered toast and jam. Staff writer Diane Peterson can be reached at 521-5287 or diane.peterson@pressdemocrat.com. On Twitter @dianepete56. See original story on the Press Democrat website.